For those of us who don’t have the time or the luxury of getting our teeth professionally whitened on a regular basis, this is a great alternative product. Most of us interested in whiter teeth have probably taken a chance with the whitening strips. Although the whitening strips do the job- slowly- sometimes we just need something with a bit more strength – without having to sit in a dentist’s chair for hours. 1- Fit the trays to your teeth. Simply put the trays in hot water — this will make the trays soft and easier to mold onto your teeth. Fit one mold at a time. Take a hot tray and place on your upper teeth – press down the mold to fit the shape of your teeth. Leave for about 30 seconds. Remove. Same thing for your lower teeth. 2-Once the trays are molded it’s time to start whitening! Open one capsule and place the gel onto the mold. Open a second capsule and place gel onto the other mold. 3- Place the trays onto your teeth and leave on for 20 min. 4- After 20 minutes, take out the trays and brush your teeth regularly! Who knew that it only takes 4 steps for bright, white teeth! The kit suggests you take 10 minute breaks between each session, 20 minutes on, 10 minutes off, 20 minutes on – for a total of 2 hours. 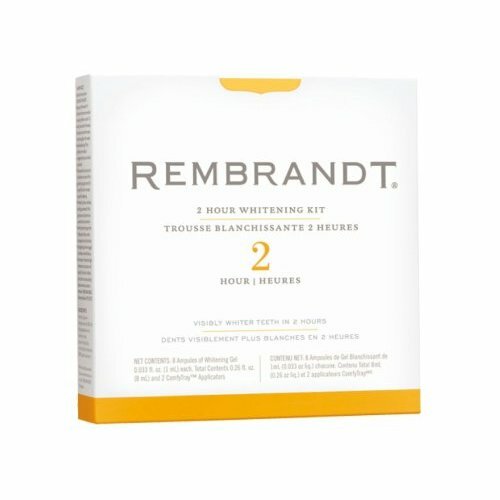 The Rembrandt 2 Hour Whitening Kit retails for around $20.00 which may seem a little pricey for only 4 sessions. However, the proof is in the whitening. After 4 sessions you will see visibly whiter teeth. I’ve noticed that you can use 1 capsule for both trays which gives you 4 extra sessions!! Now that I’ve mentioned the pros- quick, effective whitening, it’s time for the cons. If you have sensitive teeth don’t expect to get through all 4 sessions in a 2 hour time frame. The gel can get onto your gums, which can be somewhat uncomfortable. My personal experience has been that I can get all 4 sessions into one day, but not 2 hours. My sensitive teeth and gums start to burn if I put in consecutive sessions. But don’t worry- you can still get whiter teeth in a matter of one day! The other con is that the trays aren’t as inconspicuous as the whitening strips. Speaking will be difficult while you are whitening your teeth, and those around you will notice the trays in your mouth. Overall, if you are in a teeth whitening crisis and need a quick fix, Rembrandt 2 Hour Whitening Kit is the way to go. With only one session, you will most likely see a visible change in your teeth. However, if you have sensitive teeth make sure you space out your whitening sessions. This whitening habit can get a bit pricey, and painful for people with sensitive teeth, so when you aren’t in need of an instant smile make over I suggest using the whitening strips. Now you don’t have to spend hours sitting in a dentist’s chair to get those pearly whites ready for the camera. All it takes is a few 20 minute sessions!! If you’re like The Dream Team, you’ve probably noticed the explosion of energy bar types over the past several years. When all you want is a simple snack, a pre-workout fuel, or a meal replacement, there are so many choices that it can be downright confusing to choose the thing you’re looking for. Here, The Dream Team offers some assistance in choosing. Although this list is far from exhaustive, it includes our favorites and some not-so-favored bars to avoid! Luna. Made by the Clif company and tailored for women’s nutritional needs, Lunas are a crunchy, crisp textured bar dipped in delicious icing or chocolatey coating. They are composed of natural ingredients including nuts, seeds, and brown rice syrup. Luna bars are my absolute favorite! As well, they’re 70% organic and proceeds benefit the breast cancer foundation. These are great for a snack! Nutritional facts: 180 Calories, 5g fat (2.5g saturated, 0g trans), 25g carbs (3g fiber, 12g sugar), 10g protein. Flavors include: iced oatmeal raisin, peppermint stick, chai tea, s’mores, chocolate pecan pie, nutz over chocolate, peanut butter cookie, toasted nutz & cranberry. Luna sunrise. Again, specially designed for women, these bars a very similar to Luna original. Clif states that these bars a specially formulated with selected nutrients, vitamins, and minerals to serve as a great breakfast or morning snack to get you going in the morning. Unfortunately, the flavored coating is kind of funky and fake-tasting. I’d go with Luna original over Luna Sunrise. Nutritional facts: 180 Calories, 4g fat (2g saturated, 0g trans), 29g carbs (5g fiber, 11g sugar), 8g protein. Flavors include: Strawberries & cream, vanilla, almond, blueberry yogurt. Clif bar energy bar (original). Designed for the athletic individual, this bar is loaded with the carbs you need to sustain activity. The bar is designed to optimize glycemic index, meaning you won’t get a spike/crash in blood sugar. Rather, slow-release carbs steadily increase your blood sugar, followed by a gradual decline so your muscles have sustained energy. The texture is generally soft with some munchier bits. The only downside of ClifBars is that some of the flavors are kinda funky. It’s composed of natural ingredients including rolled oats, soybeans, flaxseeds, and soy flour. Good for a pre-performance fueling. It’s also comprised of 70% organic ingredients, and proceeds benefit environmental, health, and social causes including the Breast Cancer Foundation, the Surfrider Foundation, Leave No Trace, American Hiking Society, and International Mountain Bike Society. Nutritional facts: 240 Calories, 4g fat (1.5g saturated, 0g trans), 46 g carbs (5g fiber, 21g sugar), 10g protein. Flavors: carrot cake, apricot, banana nut bread, chocolate chip, chocolate peanut, cranberry apple cherry, maple nut, mint chocolate, oatmeal raisin walnut. *The Clif company also manufactures Mojo bars, ClifKid Z Bar, and Nectar bars. Clif Builder’s bar. A natural protein bar for those who put their own body “through the “wringer”. I was skeptical of this one but pleasantly surprised when I tried it!! It has a satisfying, crunchy texture. I’ll definitely be buying it again. Made from 30% organic ingredients. Nutritional facts: 270 Calories, 8g fat (5g saturated, 0g trans), 30g carbs (4g fiber, 20 g sugar), 20g protein. Flavors include chocolate, chocolate mint, cookies & cream, peanut butter, vanilla almond. Balance original. Used to be my favorite bar before I discovered Luna. Balance bars are like dessert – although they’ve got the “balanced” 40-30-30 (carbs-fat-protein) ratio going on, they taste like a delightful rich snack. The texture is amazing, perfectly moist without being mushy….almost like flourless cake but not quite. And the flavors are delightful. Nutritional facts: 200 Calories, 6g fat (1.5g saturated, 0g trans), 22g Carbs (2g fiber, 17g sugar), 14 g protein. Flavors include: almond brownie, chocolate raspberry fudge, cookie dough, peanut butter, mocha chip, honey peanut. Balance gold. Adds a layer of gooey (caramel or chocolate) coating to Balance original, and the “bar” beneath is tougher in texture compared to original balance bar texture. Nutritional facts: 210 Calories, 7g fat (4g saturated, 0g trans), 24g Carbs (<1g fiber, 16g sugar), 13 g protein. Flavors include: caramel nut blast, chocolate peanut butter, chew chocolate chip, triple chocolate, rocky road, peanut butter crunch, chocolate mint crunch, cookies & cream crunch. *The Balance company also makes bars by the name of Balance 100, Balance Carbwell, Balance Bare, & Balance Organic. Powerbar Performance (original). Somehow powerbars fuse a soft texture with crispiness, making them somewhat enjoyable to munch. They scream “processed” though, in flavor, texture, and appearance. The company states that the “C2 max” energy blend that composes these bars optimizes athletic performance to provide sustained energy to muscles. Nutritional facts: 230 Calories, 2.5g fat (9g saturated, 0g trans), 43g Carbs (2g fiber, 24g sugar), 9 g protein. Flavors include: apple cinnamon, banana, chocolate peanut butter, cookies & cream, oatmeal raisin, peanut butter, vanilla, and wild berry. *PowerBar company also makes recovery bars, protein plus, protein plus reduced sugar, harvest, nut naturals, triple threat, and pria. ThinkThin. Don’t be fooled by the sleek, posh labels! This high protein bar had a flavor that I is best described as fake, and an overly chewey texture. Obviously highly processed and I was not impressed. Nutritional facts: 240 Calories, 8 g fat (2.5 g saturated, 0g trans), 27g carbs (1g fiber, 0g sugar), 20g protein. Flavors include: peanut butter, chocolate, white chocolate, dark chocolate. *Think also makes ThinkGreen, ThinkOrganic, Think5, and thinkThin Pink. Odwalla. Good flavor, good texture – kind of resembled granola but was softer and chewier. Natural tasting, I could see the peanuts, chocolate chips, and cereal grains in the bar I sampled. According to the company’s website, this “natural” feature characterizes all of their bars. Each bar also boasts a unique vitamin/mineral combo to aid you in everything from memory to performance. Nutritional facts: 250 Calories, 7g fat (1.5 g saturated, 0g trans), 38g carbs (4g fiber, 14g sugar), 8g protein. Flavors include chocolate chip peanut, strawberry, banana, carrot, cranberry, blueberry, lemon, raisin, oats, cinnamon. Promax. Given how processed this high-protein bar is, I was surprised to find myself enjoying it. Soft like your typical high-protein bar, with little crunchy bits, and good flavor. It was satisfying, too. Nutritional facts: 280 Calories, 4.5 g fat (3g saturated, 0g trans), 38g carbs (1g fiber, 27g sugar), 20g protein. Larabar. You can tell it’s made of natural ingredients, as the company states. Blending unsweetened fruits, nuts, and spices to create the bar, no bar contains more than six ingredients. Impressive. It has a moist, almost cakey texture. A little more on the sweet side than other bars. Nutritional facts: 180 Calories, 10g fat (1g saturated, 0g trans), 23g carbs (4g fiber, 17g sugar), 4g protein. Flavors include pistachio, key lime pie, apple pie, cherry pie, ginger snap, chocolate coconut, cinnamon roll, pecan pie, lemon bar, banana cookie, cashew cookie. Kashi Go Lean Roll. My friend Liz and I nicknamed these “rock bars” because they’re so hard you feel like your teeth are going to break off when you bite into them. Whatever you do, DON’T try to eat these when they’ve been stored in a cold area!! I can’t describe anything noteworthy beyond that very salient feature. Nutritional facts: 190 Calories, 5g fat (1.5g saturated, 0g trans), 28g carbs (6g fiber, 14g sugar), 12g protein. Flavors include chocolate peanut, caramel peanut, chocolate turtle. Kashi Go Lean Crunchy. Not as hard as a rock bar, but still kinda tough! You can tell this one’s semi-natural cuz you can see the individual cereal grains composing the base bar. It’s sort of similar to a luna bar in that it has the base bar dipped in chocolate coating. Kashi states that the bar optimizes glycemic index, using slow-release carbs to prevent a sugar-headache and keep you fueled. For the most part, I agree. Nutritional facts: 180 Cals, 5g fat (2g saturated, 0g trans), 30g carbs (6g fiber, 13g sugar), 9g protein. Flavors: Chocolate peanut, chocolate caramel, chocolate almond. Taking into account taste, texture, nutritional facts, and company profile, here are my conclusions. Other top bars: Clif builder, Odwalla. The worst all-around bars: Balance gold, ThinkThin, Kashi go lean roll.